For the Spanish poem, see La Araucana. An Araucana egg (left) with white and brown eggs for comparison. The Araucana (Spanish: Gallina Mapuche) is a breed of domestic chicken from Chile. Its name derives from the Araucanía region of Chile where it is believed to have originated. It lays blue-shelled eggs, one of very few breeds that do so. Breed standards for the Araucana vary from country to country. It may have unusual tufts of feathers on the ears, and may be rumpless, without a tail and tail-bone; in the United States it may for this reason be known as the South American Rumpless. Both ear-tufts and rumplessness are caused by lethal genes, so not all birds display these traits. The Ameraucana breed and "Easter Egger" hybrids of the United States, which also lay blue or green eggs, both derive from the Araucana. The blue egg of the Araucana was at this time thought to be unique among chickens. 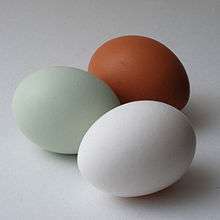 In 1933 Reginald Punnett showed that the blue egg ("oocyan") gene in chickens is dominant with respect to white, while in combination with genes for brown eggs, various shades of green and olive are produced. :17 In modern times, the Ameraucana breed, a derivative of the Araucana, also lays blue eggs, while hybrid birds carrying the dominant oocyan gene may in the United States be called "Easter Eggers". Several theories have been advanced to explain the origin of the blue egg characteristic. It has been variously attributed to hybridisation with Tinamus solitarius, a species of tinamou (dismissed as "erroneous" by Helmut Sick);:347 to genetic mutation;:349 and to the action of a retrovirus soon after the domestication of the chicken. Blue Araucana eggs were taken to Australia from New Zealand in the 1930s. The breed was standardised in the 1980s. Blue-egg chickens from South America were introduced to the British Isles at various times in the early twentieth century. The modern British-type Araucana derives from birds from a Chilean ship that was wrecked in the Hebrides. The British Araucana was developed mainly by George Malcolm in Scotland in the 1930s.:40. He introduced the Lavender plumage variety, and bred the bantam Araucana in the 1940s. The British-type Araucana was standardised in 1969 or 1974. In the United States, two breeds were established: the Araucana, which has ear-tufts and is rumpless, was standardised in 1976, and the Ameraucana, which is bearded, muffed and tailed (and thus similar to the tailed British type), was added to the Standard of Perfection in 1984. There has been a long and inconclusive debate about the origin of the Araucana and whether it derives from chickens brought by Europeans after Columbus reached the Americas in 1492, or if it was already present. A report published in 2007 on chicken bones found on the Arauco Peninsula in south-central Chile suggested pre-Columbian, possibly Polynesian, origin. A report published in 2008 found no evidence of pre-Columbian introduction from Polynesia. The world-wide conservation status of the Araucana is "not at risk"; population data for Chile is not reported. In Australia, only the tailed Araucana is recognised in the Australian Poultry Standards; both tailed and rumpless may be exhibited. The British standard accepts both tailed and rumpless; they may be treated as separate breeds. 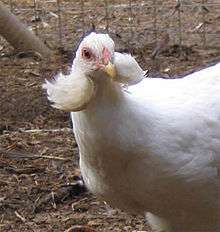 The British type of Araucana has a beard and muffs which conceal the earlobes. In North America, Araucanas have long ear-tufts and are rumpless. As both ear-tufts and rumplessness are caused by autosomal dominant lethal alleles, not all of the birds can display these traits. ↑ Barbara Rischkowsky, D. Pilling (eds.) (2007). List of breeds documented in the Global Databank for Animal Genetic Resources, annex to The State of the World's Animal Genetic Resources for Food and Agriculture. Rome: Food and Agriculture Organization of the United Nations. ISBN 9789251057629. Accessed June 2014. 1 2 3 4 5 6 7 8 Victoria Roberts (2008). British poultry standards: complete specifications and judging points of all standardized breeds and varieties of poultry as compiled by the specialist breed clubs and recognised by the Poultry Club of Great Britain. Oxford: Blackwell. ISBN 9781405156424. 1 2 Recognized Breeds and Varieties As of January 1, 2012. American Poultry Association. Archived 28 February 2013. ↑ Breed Classification. Poultry Club of Great Britain. Archived A17 June 2011. 1 2 3 Nestor Fabio Valencia Llano (2011). La gallina criolla colombiana (in Spanish). Colombia: Universidad Nacional de Colombia, Sede Palmira. ISBN 9789588095561. ↑ Eugene M. McCarthy (2006). Handbook of Avian Hybrids of the World. Oxford: Oxford University Press. ISBN 9781429405256. ↑ Helmut Sick, William Beldon (translator) (1993). Birds in Brazil: A Natural History. Princeton, New Jersey: Princeton University Press. ISBN 9780691085692. ↑ Frederick Bruce Hutt (1949). Genetics of the fowl. New York: McGraw-Hill. ↑ David Wragg , Joram M. Mwacharo , José A. Alcalde, Chen Wang, Jian-Lin Han, Jaime Gongora, David Gourichon, Michèle Tixier-Boichard, Olivier Lanotte (2013). Endogenous Retrovirus EAV-HP Linked to Blue Egg Phenotype in Mapuche Fowl. Plos One. doi:10.1371/journal.pone.0071393. 1 2 3 Breeds In Focus: February 2013 - Araucana. The Rare Poultry Breeders' Association (Australia). Archived 12 June 2013. 1 2 3 Araucana (British type). Rare Breeds Survival Trust. Archived 3 October 2015. ↑ History. The British Araucana Club. Archived 10 July 2016. ↑ Storey AA, Ramírez JM, Quiroz D, et al. (June 2007). "Radiocarbon and DNA evidence for a pre-Columbian introduction of Polynesian chickens to Chile". Proc. Natl. Acad. Sci. U.S.A. 104 (25): 10335–9. doi:10.1073/pnas.0703993104. PMC 1965514 . PMID 17556540. ↑ Gongora J, Rawlence NJ, Mobegi VA, et al. (July 2008). "Indo-European and Asian origins for Chilean and Pacific chickens revealed by mtDNA". Proc. Natl. Acad. Sci. U.S.A. 105 (30): 10308–13. doi:10.1073/pnas.0801991105. PMC 2492461 . PMID 18663216. ↑ Transboundary breed: Araucana. Domestic Animal Diversity Information System of the Food and Agriculture Organization of the United Nations. Accessed October 2016. ↑ Araucana/Chile. Domestic Animal Diversity Information System of the Food and Agriculture Organization of the United Nations. Accessed October 2016. 1 2 The Breed Standard. British Araucana Club. Archived 6 February 2013. ↑ Araucana Spitzhauben/United Kingdom. Domestic Animal Diversity Information System of the Food and Agriculture Organization of the United Nations. Accessed October 2016. ↑ Araucana (Rumpless)/United Kingdom. Domestic Animal Diversity Information System of the Food and Agriculture Organization of the United Nations. Accessed October 2016. ↑ Somes Jr., R.G. ; Pabilonia, M.S. (1981). "Ear tuftedness: a lethal condition in the Araucana fowl". The Journal of Heredity. 72 (2): 121–4. PMID 7276512. ↑ Liste des races et variétés homologuée dans les pays EE (28.04.2013). Entente Européenne d’Aviculture et de Cuniculture. Archived 16 June 2013.